The early days of basic coat coloration in a Doodle are long gone. Now we can easily find Doodles of just about all colors and variations. QHow is it that all of these variations occur? AYou can really thank the poodle part of the Doodle for all the variety. That’s because Retrievers, both Labs and Goldens, have little variation in their breed standard. Labs only come in 3 colors, and Goldens are, well, golden colored. Poodles, on the other hand, come in many variations. The American Kennel Club (AKC) recognizes the following purebred poodle colors: blue, silver, grey, brown, cafe-au-lait, cream, and apricot. While parti-colored poodles (and other rarer colorations) are not recognized, these colors do appear in poodles as well and can be passed onto generations of Doodles. The variations that now occur in Doodles is almost limitless. To understand how these variations occur, we have to look at genetics. Genetics into coat variations can quickly become tricky, but DNA testing is now allowing breeders to discover what is inside a dog’s genes. In the case of poodles, just because a dog is black doesn’t mean that dog would only produce black puppies. We have to look at the genotype of a dog not just the phenotype, or what he looks like. What DNA testing has shown is that there is a b allele and an e allele. Alleles come in pairs like BB, Bb, EE, or ee, and each parent passes one allele down to its offspring. Genetically speaking, b represents brown (or B is a dominant black), and e represents coat color shadings of cream, apricot, red, or white. A dominant E (extension gene) following B/b is what dictates if the dog will be colored brown or black. If there is a small e instead, this is a recessive cream trait. A dominant gene will always mask a recessive gene. For example, a poodle with the genes of BBEE would be a black poodle with black pigmentation. This is because black is dominant. But we could also have a black poodle that looks entirely black and has a different genetic code. It may be BbEe instead which indicates brown recessive genes. There is a recessive brown trait (b) and a recessive cream trait (e), but since black (B) is dominant, the dog appears black. There are many, many combinations possible using just the b and e alleles without even factoring in how parti-colorations (or others such as phantom, brindle, etc.) occur. Before DNA testing, breeders simply mated phenotype to phenotype and were often surprised at the outcomes. That’s because breeding one black dog to another black dog doesn’t always equal black (or any other color for that matter). To better understand the DNA testing of poodles for coat color as well as look at an excellent chart, visit VetGen’s website. Doodle genetics get even more complex than this since we didn’t factor in the Lab or Golden side of the equation! 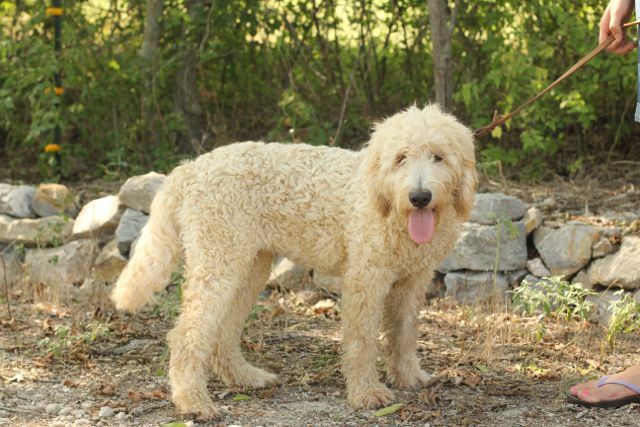 The good news is that if a breeder wants to know exactly what lies in the genetic code of a particular Doodle, a DNA test can show what are dominant and recessive traits in that dog, just like it can for poodles. This makes it less of a guessing game to produce particular colorations and markings. There are a whole lot of other genetic factors that create diluted colors (like blue, grey, silver, brown, or cafe-au-lait), brindles, and parti-colored dogs. These are recessive genes that create these variations, so this is why these color combinations are rarer in the Doodles. 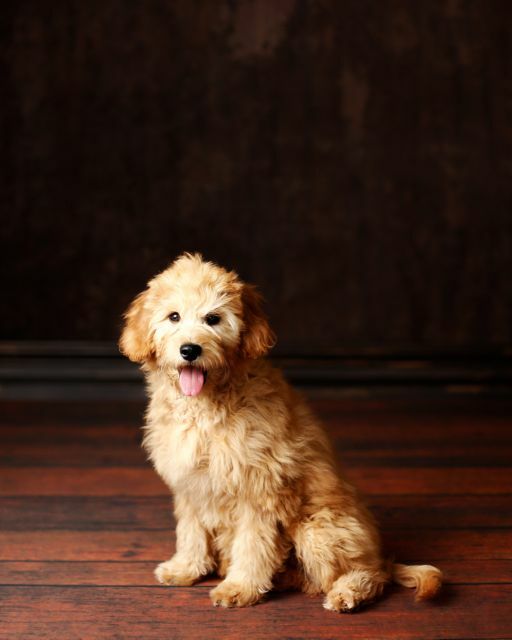 It is more likely to occur in multiple generations since there is more poodle in the pedigree (via backcrosses to poodles or Doodle to Doodle). When breeding recessive genes to recessive genes, the resulting puppy colorations can be surprising, making it much harder to predict. Merle coloration, on the other hand, is not a recessive trait but rather a dominant one. It will override solid coloration. In order to have merle occur in puppies, one parent must be merle colored itself. Two merle colored dogs should never be bred together. Unfortunately, doubling up on merle can sometimes result in blindness, deafness, or eye deformities. 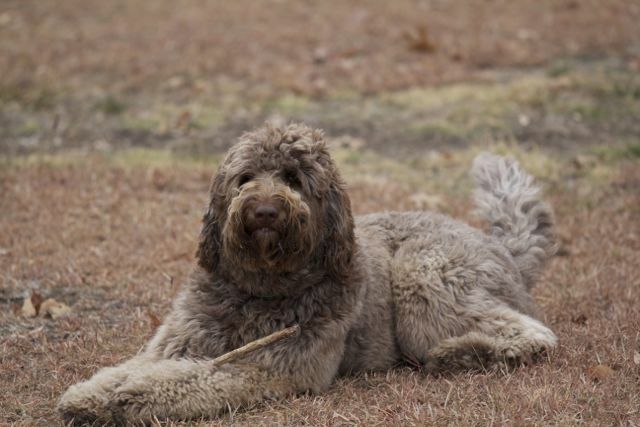 Merle colored Doodles are most common when the Doodle combination is a poodle bred to a Border Collie or Australian Shepherd, but it can also occur in other Doodle combinations too. For those people looking for these rarer colors, your best bet will be a puppy resulting from multiple generations of Doodles where recessive traits were encouraged instead of masked.